The Office on Disability plans, develops, and works in coordination with the various supportive services for people with disabilities. There are a number of community organizations for individuals with disabilities in Atlantic County offering various recreational activities. The non-profit organizations included below are provided for informational purposes only and do not reflect any endorsement of their programs and services by Atlantic County government. 21 Down: A Down Syndrome Awareness Group. A local group providing family support through meetings, social events and more. Accessible Fishing: The NJ Department of Environmental Protection, Division of Fish and Wildlife's web site posts a listing of accessible fishing sites throughout NJ. Atlantic County's John F. Gaffney Green Tree Golf Course: Can provide a marker noting handicapped access to attach to a golf cart. For information, call the Pro Shop at 609-625-9131. Atlantic County's Office of Cultural and Heritage Affairs: Develops cultural programs, exhibits and displays including the fine and performing arts and the literary arts, engages in historic research, publishes reports and engages in related activities which promote and develop public interest and understanding of historic and cultural matters. Atlantic County Division of Parks and Recreation: Provides environmental and recreational programs programs on over 6,200 acres of county-owned open space and park properties. Services include: programs for all ages, hiking trails, picnics, playgrounds, camping, golfing, fishing, boating, and pistol shooting range. Challenged Athletes Foundation: A national organization supporting people with physical challenges through grants, camps, clinics and mentorship. Faces4Autism: Autism education, support and programs. Heart of Surfing: Surfing a various recreational activities for all ages. John D. Young Memorial Lions Center for the Blind: Located in Absecon, for individuals who are blind or visually impaired. Library Equal Access Program (LEAP): 1-800-792-8322 or TTY (877) 882-5593. Talking Book & Braille Center. A free library service for residents of all ages with vision impairments and all abilities. Massi’s Mission Swim Project: Water Safety and Swimming Programs for children with Autism. Nothing Down: Locally based in Atlantic County, an international support and advocacy social group promoting ‘there’s nothing down about down syndrome’. Senior Centers Congregate Program: For residents (60) years of age and older. Lunch, activities, socialization and recreation at (9) municipalities throughout the county offering free transportation. Sled Stars: Sled Ice Hockey for physically challenged youth. South Jersey Field of Dreams: Located in Absecon, this accessible barrier free baseball field with a surface that allows wheelchairs and walkers to be used by athletes, offers many programs and team events all year long. Special Olympics NJ: Local ‘Area 8’ Programs: Through the power and joy of sports, Special Olympics New Jersey transforms lives. Local teams include: cycling, football, golf, soccer, skiing, hockey, snowshoeing, basketball, bowling, bocce, softball, swimming and tennis. Athletes of any skill level can participate. The Arc of Atlantic County: Whether it is playing a sport, learning new life skills or enjoying social activities, there is always something fun happening through The Arc of Atlantic County’s recreation program. Many of our recreation programs are open to anyone without approval from the DDD. The Atlantic County Society of the Deaf, Inc.: A social organization for people who are deaf. 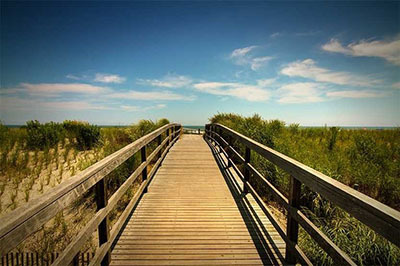 Enjoy access in every community along our beautiful sea and lake shores. Accessible beaches are available in every Atlantic County community. Contact the municipalities as listed below, to inquire about the access points, pathways of travel surf chair reservations and availability, or any special accommodations or assistance. Atlantic City: Atlantic City Beach Patrol Headquarters 609-347-5312. Further information and access map for the Atlantic City Boardwalk can be found on the CRDA's tourism site..
Brigantine: Brigantine Beach Patrol: 609-266-5233. Hamilton Township: beach at Lake Lenape's The Cove in Mays Landing. Contact Special Projects Coordinator at 609-625-1511 x455 for information, specific seasonal open times and lifeguard hours. The Atlantic County Society of the Deaf, Inc.